A team of researchers with members from Brazil, South Africa and the U.S. has found an example of homophily among dolphins who work together with fishermen in Brazil for the mutual benefit of both. 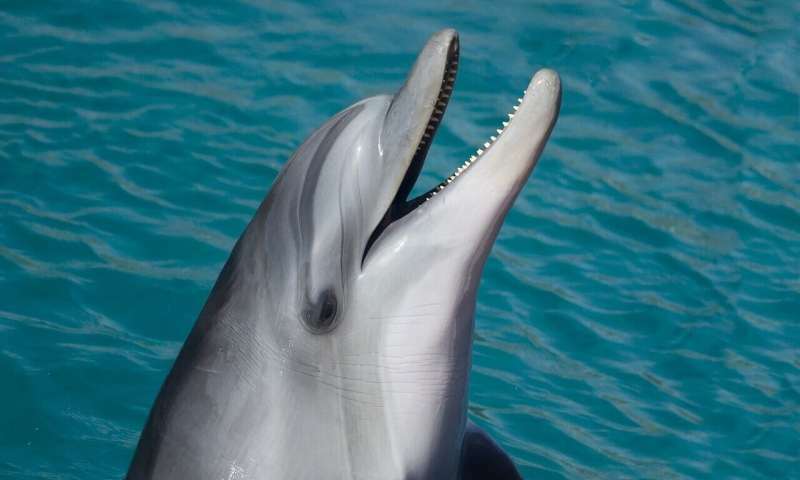 In their paper published in the journal Biology Letters, the group describes their study of the dolphins and what they found. In Laguna, Brazil, there are fishermen who have formed an alliance with wild bottlenose dolphins living just offshore, both of whom target mullets, a type of fish. The dolphins have found that if they herd groups of the fish toward the shore where the fishermen are waiting with nets, they make it easier on themselves to catch fish. The dolphins slap their heads or tails on the water when the fish are close enough for the fishermen to catch them. Upon seeing the signal from the dolphins, the fishermen cast their nets. When they do so, the fish begin to break away from their school, making it easier for the dolphins to catch them. But it was not the relationship the dolphins established with humans that the researchers were studying—they wanted to know if working together resulted in the formation of social relationships in dolphins. To find out, the researchers focused on a particular group of dolphins that were known to assist in helping the fishermen—they followed them with cameras, capturing details of their activities both during fishing expeditions and the times between them. The researchers report that the same individual dolphins that fished with humans hung out together even when they were not fishing. They would swim around and play together, clearly preferring the company of one another over the company of other dolphins in the area. They were even seen taking naps together. The researchers claim the behavior they observed in the dolphins was an example of homophily, which sociologists define as behavior by individuals in a group who associate in a social manner with those who engage in that behavior with them—in this case, fishing with humans. They suspect that the fishing behavior they engage in is likely learned by watching others in their group as they grow up—a behavior that could be part of a cultural tradition. Yes, Tursiops is smart enough to have culture. It's not all about building fires. These dolphins are smart enough that they don't have to spend most of their time seeking food. What else are they gonna do when they're not hunting fish? And cooperating with the fishermen gives them yet more time. I doubt they have the memes to rationalize it that way, but that's the upshot.